Okay, this is too weird: Strange reflections on the dwarf planet Ceres. 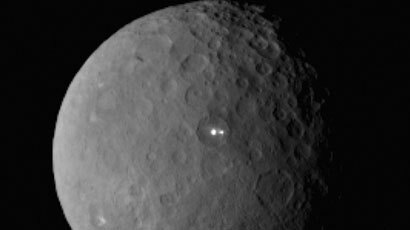 As you know, NASA's Dawn spacecraft is on its way to orbit Ceres - a Pluto-sized dwarf planet which is the largest celestial object between Mars and Jupiter - and pictures taken of the planet show two bright spots directly in the line of flight. Wow. So what do you think, ice, or distress signals from alien space travelers who crashed onto the planet? Meanwhile: NASA sending probe to Europa in search of ancient life. Europe is an icy moon of Jupiter widely believed to be a possible location for Earth-like life forms. Yay.